This is a new edition of an international bestseller first published in 1986. The author, a professional soldier, served for 26 years in all parts of the world with the British Army's Special Air Service, and later became their survival instructor. The members of this elite unit, working in small groups, are trained to carry out operations in remote places where they may be forced to live off the land while handling every kind of situation and problem. 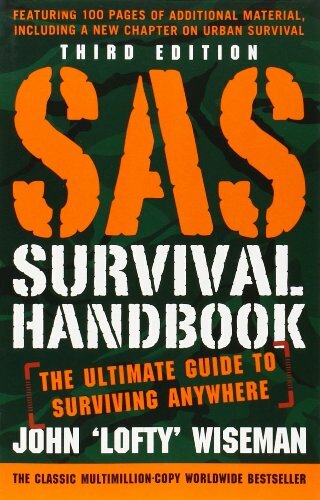 The tried and tested skills needed for survival under all conditions form the basis of this book, which contains an absolute wealth of information. Briefly, it starts with a section on "Essentials"; how to prepare yourself for any expedition, and what equipment to take along. "Strategy" discusses accident situations and how to deal with them. The next section describes the major types of climate and environment and suggests ways of overcoming the problems they present. There is a long section on food- what can be eaten, where to find it, and how to prepare it. Then comes a comprehensive chapter on campcraft, including types of shelter to build, fire making, cooking, tools, ropes and knots. "Reading the Signs" is about map reading, direction finding without a compass, and how to read the clouds and predict weather changes. The next section is on travelling through difficult terrain, crossing mountains, fording rivers and using waterways. "Health" contains first-aid tips, a list of medicinal plants, poisonous snakes and dangerous sea creatures. After a section on "Survival at Sea" there is one on search and rescue that includes signals and codes. The final chapter is on major disasters, both natural and man-made, and surviving at home when all services and supplies are cut off. None of the sections is designed to stand alone, and most overlap with others and should be read in conjunction with them. This is an essential guide for all outdoor enthusiasts and adventurers.